Without a doubt, the only really essential item for school, preschool or daycare is a backpack. There’s no getting round this one – but why would you want to when they’re as cool as these? I make no secret of my love for Skip Hop Zoo backpacks. It seems Australia is catching on because these cute as cute can be backpacks are starting to pop up all over the place – but they keep bringing out more animals in the range, so it’s a bit hard to stop buying them. Imagine if you had eight kids! 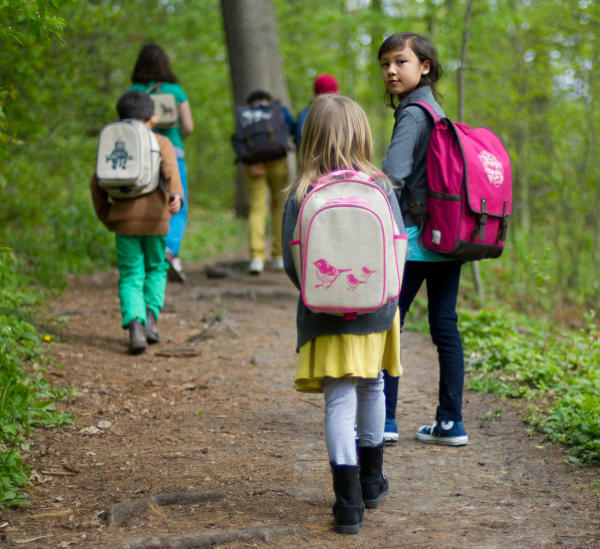 Then you could get eight of these backpacks and line them all up in a row… ok, never mind. Bright Star Kids has lots at $34.95 each. Is there a little guy or girl at your place who loves robots? They’ll get a kick out of this backpack, perfectly sized for toddlers and preschoolers. With easy access to all its pockets and plenty of room inside, it’s perfect for little hands. 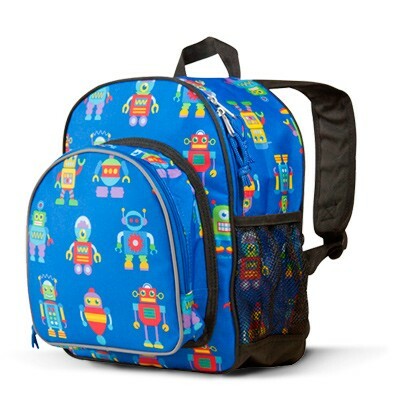 It’s the Robot Backpack from Olive Kids, and you can pick it up at Little Blessings for just $29.95. These great backpacks from Apple and Mint have an easy-clean coated linen exterior, so they’ll stay looking just as great as when you first bought them. They’re insulated inside, and they’re just a little bit bigger, which makes it easy to lug around a change of clothes (and even shoes!) as well as your lunch. There are six fun designs in the range, and you can check them out at Apple and Mint, where they are $44.95. 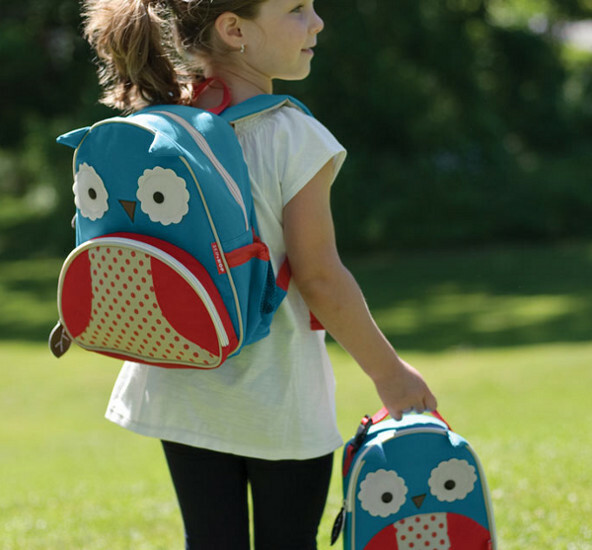 If it’s small but oh-so-adorable that you’re looking for in a bag, the toddler backpacks from Woddlers will tick those boxes. This is Olive the Owl, but there are plenty of her friends in the range too. At $35.95 each, they are strong, easy to keep clean, and sure to be adored by your little person. They’re not backpacks, but they are super useful, and I’ll be lining up to buy them myself this year. What are they? Library bags, my friends. I tried to make one for my son in kindergarten, but after about of month of use it was rejected for being “not cool” – so this time I’ll save my energy and just get one I know he’ll love. These ones are from Spencil, for just $12.95 each. 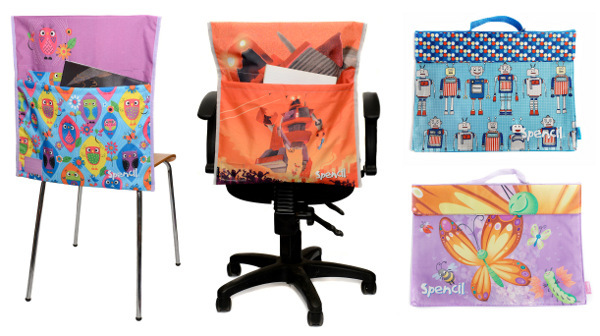 On the left, also from Spencil – chair bags! It’s the first time I’ve seen them, but I think they just might be the answer to my five year old’s ever-expanding craft and drawing collections. Also priced at just $12.95, they are a cheap solution for a very messy problem! Back to backpacks, and the range from So Young are well worth a look. They come in three sizes, but the toddler size gets a special mention because of its detachable lunchbox. What looks like an outside compartment in the picture above is actually a totally separate lunchbox with its own handle. No need to use up the precious space inside the backpack on lunch! You can find the whole So Young backpack range at Mini Hippo, where the toddler sized backpack is $69.95. 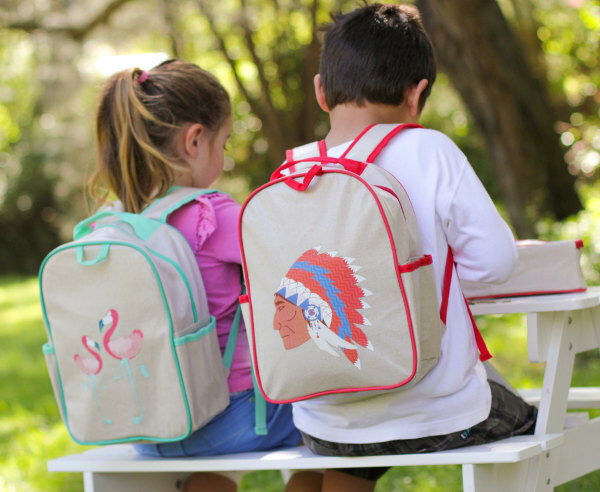 If you like it then you’d better put your name on it – and that will be no problem at all if you buy a backpack from Tinyme. Not only do they come in three sizes and three colours, but there is an almost unending array of cute pictures to adorn them with. Seriously, get a cup of tea and a spare hour, and sit down to check out all the combinations. Mini backpacks (centre) are $39.95, medium (right) are $49.95 and large (left) are $69.95. You can play around with all the combos at Tinyme. Ah, dinosaurs! You can’t beat them really, as a backpack motif. 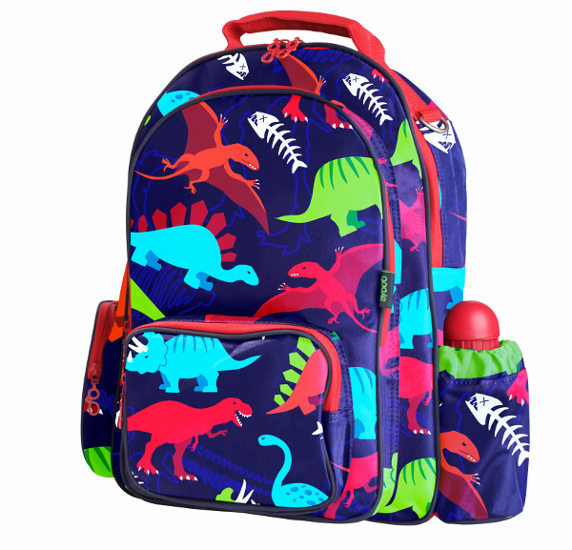 This is the large backpack from Gooie, and of course it comes in plenty of designs, not just dinosaurs! This one is seriously roomy, with ample space for A4 notebooks as well as lots of pockets and much, much more. What sets it apart? The stainless steel drink bottle that’s included as part of the deal. Check out the range at Gooie. This one is $59.99. If it’s a sturdy pack with lots of storage options that you’re looking for, you should check out the range at Stuck on You. 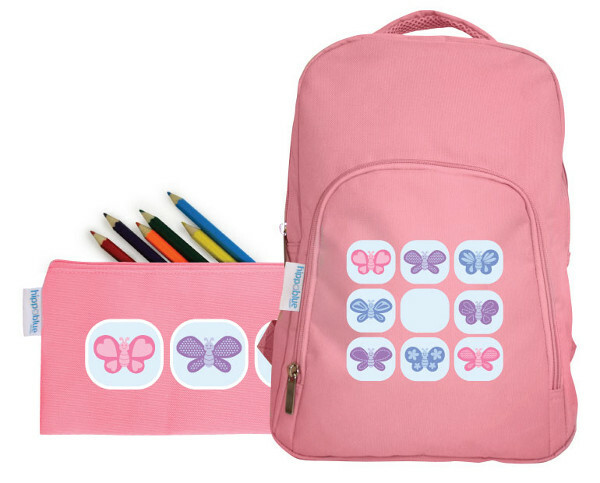 With plenty of pockets, and a good size for preschoolers as well as school aged children, these backpacks can be personalised with names (in a font of your choice) and pictures, and come in three colours. They are fully lined, and get rave reviews for their durability. Best of all, they’re only $49.95. Here’s another one you can personalise – it’s from Hippo Blue. 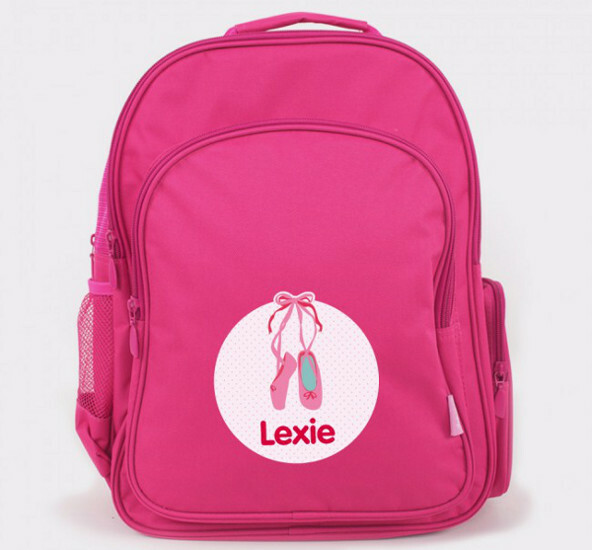 There are plenty of motifs to choose from, the backpacks come in blue or pink, and you can add any wording you like to them as well. The backpack by itself will set you back $44.95, but you can also get it in a combo pack with either a pencil case ($55.92), or with a lunchbox ($59.92). Check out all the options available at Hippo Blue.